In the Christian church of the first centuries after Christ Easter was the most important feast. It still is in the Eastern-Orthodox Church, but over the centuries Christmas has gradually taken over that position in the churches of Western Europe. This is reflected by stories and carols which have more to do with popular piety than by the actual story of Jesus' birth as told in the Bible. The church didn't do anything to suppress this development. On the contrary, folk tales and Christmas carols were excellent instruments to spread the teachings of the Church among common people, in particular those with little or no education. As a result a whole repertoire of carols came into existence, some of which are international in character. But most countries also have their own particular carols, with their own texts and music. And sometimes regions have their own repertoire as well, often in their own dialect. 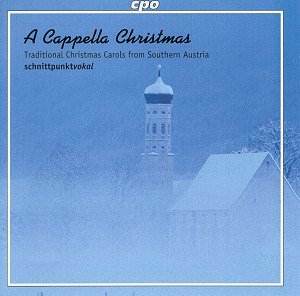 This disc delivers an example: it brings carols which are sung in Carinthia, a region in Southern Austria. They are all sung in the regional dialect, which is strongly different from Standard Austrian-German. Therefore it is a serious omission that the booklet not only doesn't give the translation of the lyrics, but no lyrics at all. Even native German speakers will hardly be able to understand what the carols are about, unless they are from the region itself. Only a couple of pieces from German speaking regions elsewhere can be understood. So it is anybody's guess what these carols are about. It may be assumed, though, that their content isn't that much different from that of carols in other countries and traditions. By the way, not all carols are 'folk songs' in the strict sense of the term. Some have been composed during the 20th century. In the booklet Peter Paumgarten describes how singing together in choirs and smaller vocal groups is a long-standing tradition in Carinthia. He and his brothers have grown up with a number of carols recorded here. "We had the good fortune of being initiated by our parents from our earliest childhood into the mysteries of singing in several parts at the evening kitchen table ("I'll sing it for you, then you sing the second part/upper voice ...")." The men's quartet schnittpunktvokal is an ensemble which sings a wide variety of music, among them the part songs by Schubert and contemporary compositions written for it. The fact that the upper voice is sung by a male alto is entirely in the regional tradition: "In male ensembles the high tenor voice is almost always sung in falsetto". All the same the way the carols are sung here is probably a lot more sophisticated than how they are traditionally sung by choirs and ensembles in the region. That, of course, is always the problem when professional singers are performing traditional repertoire. If one wants to hear how this kind of music is sung by the people one has to look elsewhere. From a purely musical point of view one may support the artistic creed of the ensemble which is to keep the interpretations pure and simple and free from sentimental dead weight. But could it be that the sentimental approach of these carols is an indispensable part of the living tradition of the region? The singing of the ensemble is very fine, no doubt about it. And it is a good idea to present this repertoire in a performance like this to a wider audience, which would probably never get acquainted with it, if it was sung by a more traditional choir or vocal ensemble. From that perspective this disc can be recommended without reservation. But one may assume it can only give a hint of what the living tradition of Carinthian carol singing is all about. And the purpose of this recording would have been served a whole lot better if CPO - as usual - had printed the lyrics and their translation in the booklet.